When you grow up on a farm, death along with birth becomes a natural and normal flow of life. I know this because I grew up on a farm myself with the experience of seeing it all in terms of the life cycle of animals. We loved some, we ate some, we watched some being born and some decaying. We held our own little funerals for others. I started collecting animal bones as a young child and the death of animals is a recurring theme in my photography. The horse that I saw being born as a young child on our farm lived with me for 35 years through every state I moved to and with every man I lived with until the day of his (Apache's) death. I secretly buried him. Images of horses and horse bones keep also showing up in my photography. 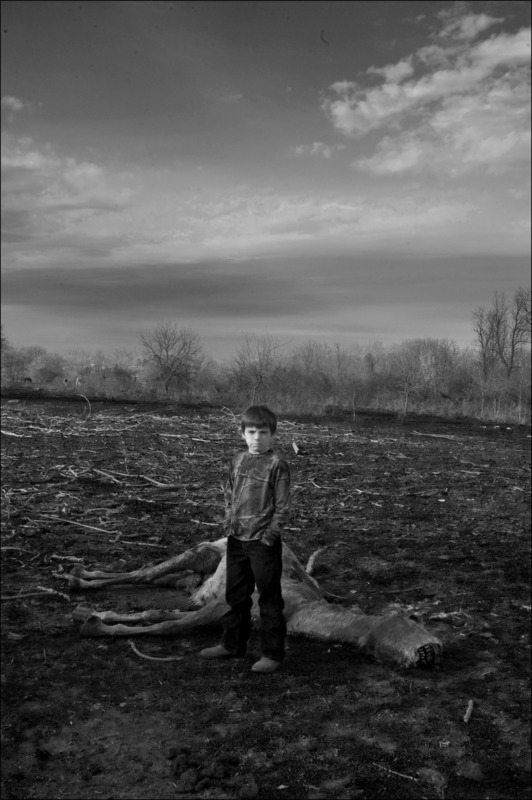 Add a young boy to the scene in a barren field under a dark sky, standing strong and exact in front of a dead horse with his hands driven into his pockets, staring at you or "starring you down" and there is much to feel, learn or/and to question. And way, way, in the distance there are "live" grazing horses. If I were to give this photograph a "fictional" title instead of a documentary title, I would have called it, "The Hobbit and His Horse." For Lord of the Rings, Tolkien wrote that Hobbits were capable of great courage and amazing feats but shy. This photograph makes me both think and feel these things; great courage, amazing feats. I photographed totally in black and white film until my first color/digital photographs in 2004. I still shoot 85% with film making silver prints in the darkroom and processing film in my kitchen sink. I'm working on a major project directing other photographers in film along with myself in documenting Jefferson County, West Virginia, in black and white film. The evening I came across Logan and his dead horse, I had just shot my last exposure on my last roll of film for my day out shooting. This image was capture with a digital Nikon SLR. While I have learned to love color and many of my documentary photographs are in color; I felt color would be too distracting for this image and that the abstraction of black and white would serve this mood of this scene better. I don't normally like to "lead" my viewers or give them this much help in looking and of things to think about. However, for this photograph, I think it's important to help people "see" the dead animal. People don't like to see dead animals and not many people have the experience of seeing a dead horse. I'm afraid that we may be a society that doesn't see dead people either. And I wonder if this is good. I think we understand more about life; by honoring and "seeing" death. I saw my father dead. It was a good thing and has made me a better person. I think this image of Logan and his dead horse helps in this honoring and seeing. As a photographer, I would like to think that the best of photography always helps us to see, to think, to honor. Limited Edition Prints of 10.